My shop has always been unorganized. Every time I would get a new tool I would just find an empty space and stick it in there. Well, now I don’t have anymore empty spaces so I am being forced into organizing. 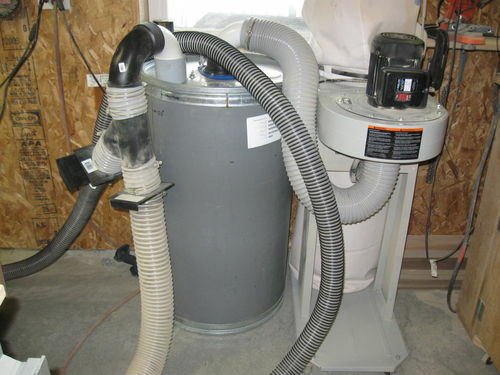 A proper dust collection system has always been on my to do list but until now I have settled for making due with my 3/4 HP Jet Dust Collector, a Thein separator, lots of flex hose, and a shop vac. 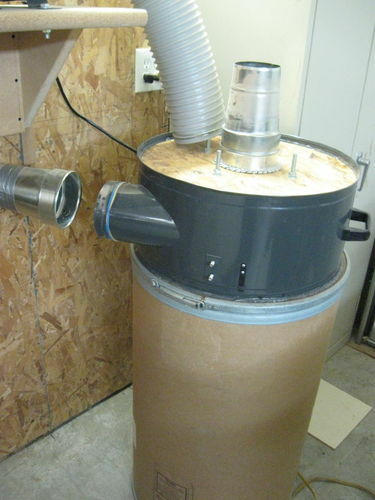 I have been eying the 2hp Harbor Freight dust collector, model 97869, made by Central Machinery for some time. They finally ran a sale on these puppies and I pulled the trigger and brought on home, put it together, and fired it up. Compared to my Jet D.C. this thing whispers. Now we get to the ”not leaving well enough alone” part. As soon as I knew it ran, I tore it apart. The space I wanted to put it in was the same space shown in the above photo but I didn’t want it mobile, I wanted it permanent. I also wanted to incorporate a Thein separator into the system. I didn’t like how low the motor sat to the ground and wanted to raise it up out of the way. Also, and I know this will probably cause some controversy, I didn’t want to deal with having to buy an expensive 2 micron after market canister filter for it. More on that later. I realized that the design of the H.F. collector body was perfect for incorporating a Thein baffle with the minimum of effort and also, that as luck would have it, it sat perfectly on top of a drum I had sitting in my storage shed. Those of you that know me, know that I will use materials at hand rather than to buy it. I also have a tendency to value function over form, and, I try to not modify anything to the point that it can’t be returned to its original state in case my grand plans fail expectations. 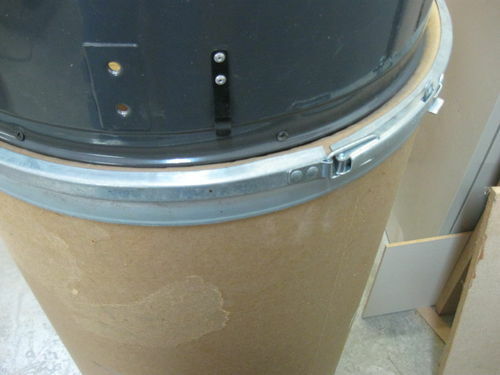 The first order of business was to make a Thein baffle for the bottom of the collector body as well as a closure ring for the top. 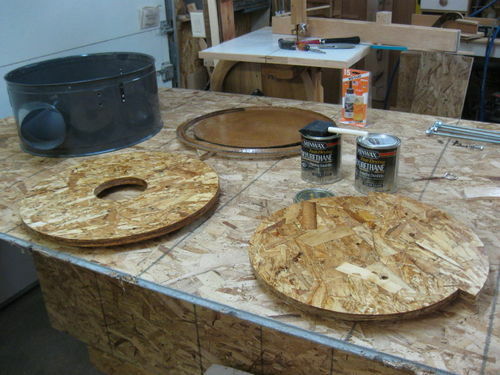 I used 3/4” OSB the make these since that is what I had on hand. I applied three coats of poly to them to smooth out the surfaces some. 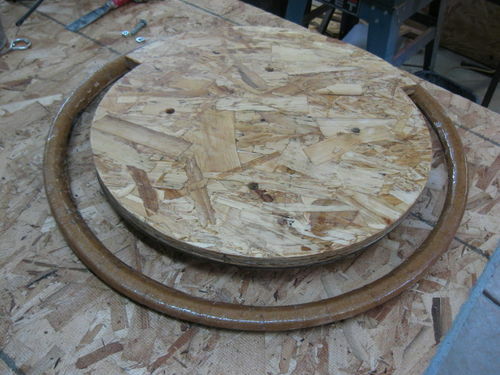 I wanted to use the retaining ring on the drum as a way to fasten and seal the collector body to the drum. 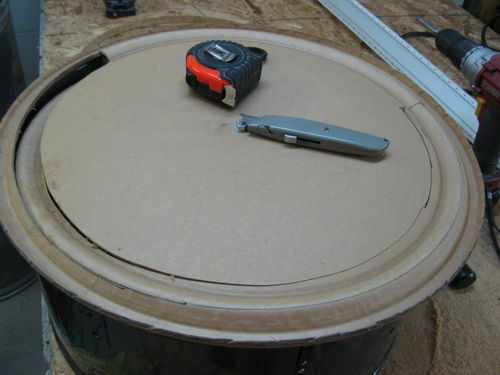 I cut a slot in the drum lid to match the O.S.B baffle, stiffened the lid by applying epoxy to both sides, then attached the drum lid to the under side of the baffle. 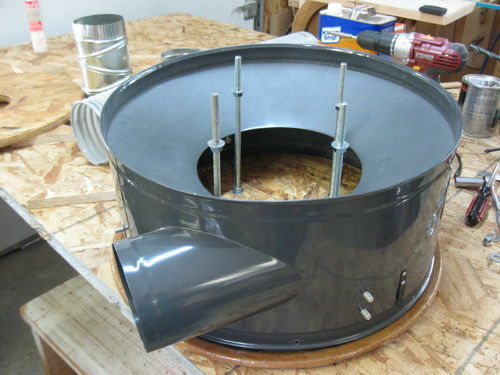 I had to support the Thein baffle and attached lid the to closer ring at the top of the collector body. I did this with four 5/16”x11” all-threads double nutted to both the baffle, lid, and closer ring. 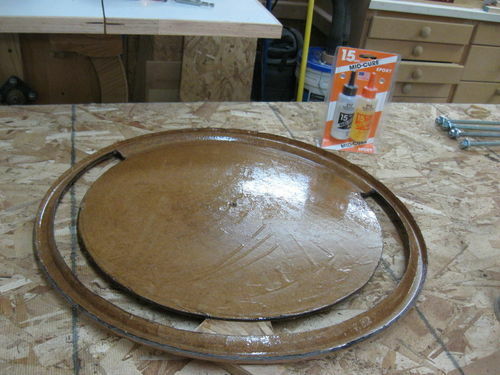 Once the collector body with the Thein baffle, lid, and closer ring were all assembled I siliconed the collector body to the rim of the lid being careful not to interfere with the retaining ring of the barrel. It is worth noting that this model of the H.F. D.C. has 5” dia. motor intake, exhaust, and collector body ports which is an awkward size to work with so I had to use 5” to 4” galvanized reducers so I could use the more common 4” dia. fittings and tubing. Once I had the collector body modified with the Thein baffle and positioned on the drum it was time to place the motor in a more convenient location. 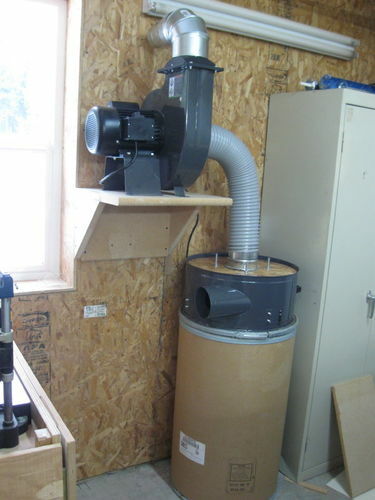 I built a shelf and mounted the motor high enough on the wall as to not interfere with the location of the duct work. Once the motor was secured to the shelf it was time to duct the exhaust through my shop wall. I realize that for some of the more environmentally conscience of you that may be reading this blog this might not sit right with you. Just let me say this, we live on 11 acres in Northern Idaho with gravel roads and drive ways, our dirt is like talcum powder during the dry months. The amount of saw dust exhausted to the outside is miniscule in comparison. Our neighbors horses stir up more dust in a day then I will exhaust in a year. 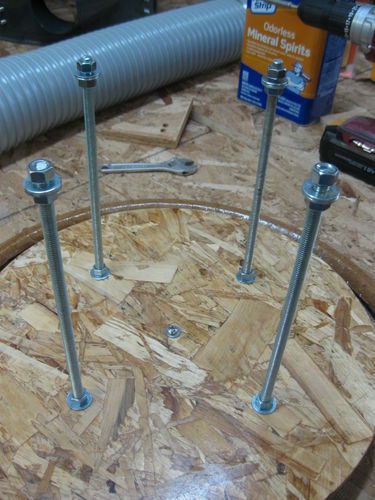 The next part of this blog addresses my solution to mounting the 4” duct work. 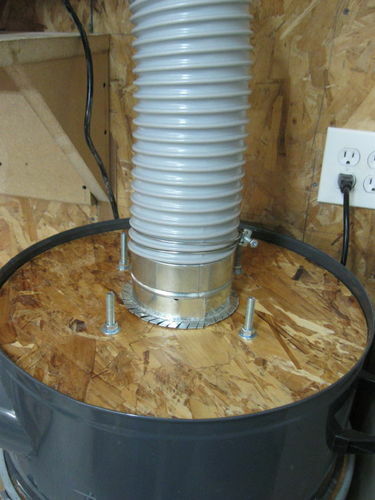 I decided to use galvanized sheet metal duct rather than the more commonly used PVC. Great job! Absolutely outstanding, and with great photographs and write up. Too bad you are taking a 6” pipe and exhausting it to 4. Every bit that you restrict hurts. if you want the flapper exhaust, consider a wye and attach 2 of the flappers to they wye, so you are still pushing a large amount out. Lee, That is one clever set up. I Love this idea! 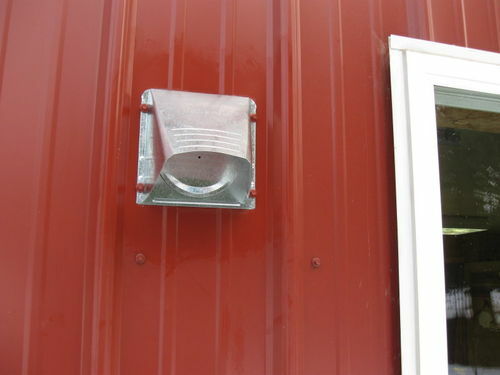 But I was thinking….Could you make your own 6” outdoor vent somehow so you could have a 6” air flow for the entire project? I think it would have less restriction on the air flow. Just my thoughts. Super nice job on this project I must say. really nice, i would like to do this in my shop. I don’t think the objections some would have are related to exhausting dust, but rather the exhausting of air conditioned or heated air, and/or pulling a negative pressure in the shop area causing possible back drafting of any gas appliances you may have. A business could not do this but the present EPA is too concerned with obama’s war on coal and curbing production of CO2 to be bothered with particulate emissions. You are really hurting the performance of your system by going to all that 4” pipe, but that loss is probably offset by the gains of not pushing air through a filter. I usually don’t recommend the Thein separators on single stage dust collectors, but in your case without a filter it should work fine. Nice job. Think I might borrow your idea for a similar setup. Good stuff. Thanks to both John H. and John C. for your kind words. Thanks for the good advise Jeff, I will reconsider the vent setup. Tony, apparently the D.C. is designed for 5” dia. 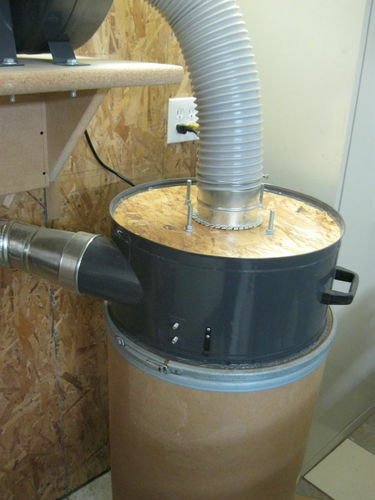 ductwork. 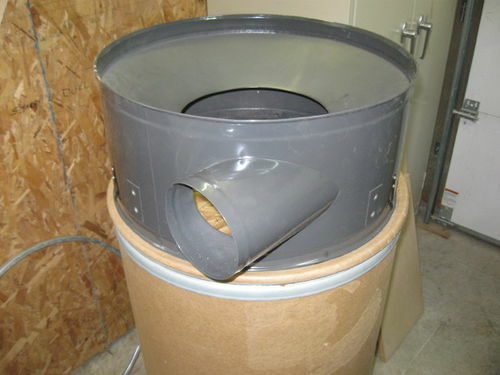 I didn’t see anything at either Home Depot or Lowes in their galvanized fitting/ductwork section that fit the bill. 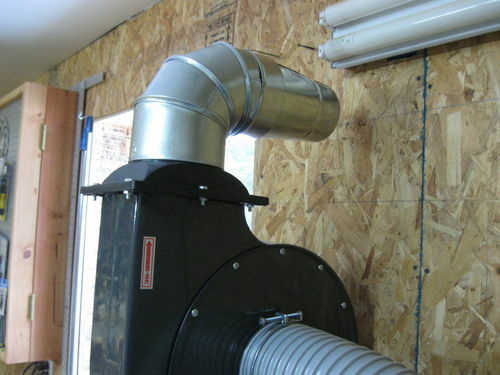 Your point about making a 6” vent is a valid one if I weren’t so lazy :-) Hopefully using metal ductwork rather than PVC and not pushing air through a filter will partially compensate for whatever air flow restriction I have created by using 4” pipe. You might want to try making a n insulated blast gate at the wall to keep cold air from coming in when not in use. Lee, I think you are on to something here. These are some great ideas and you put it together well. Really like the way the motor is installed above. 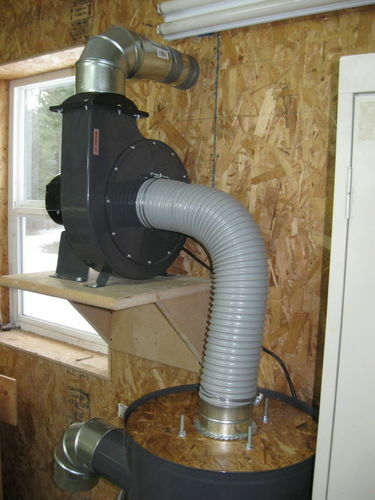 I will be giving this a lot of thought when the time comes to change out the dust collector. badcrayon, thanks for the insight, I will take it to heart. Dave, thanks buddy, I am no D.C. expert but this is certainly a cut above what I had. I really did not like the way H.F. designed the motor so close to the floor. I guess it would be O.K. 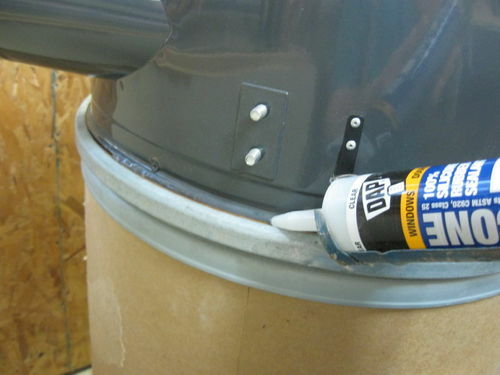 if you were running your duct work along baseboards :-). Some gr8 ideas going on there Lee. You can’t beat those HF collectors for their price. Thanks Roger, those particular H.F. dust collectors got good reviews so I took a chance. Looks good! 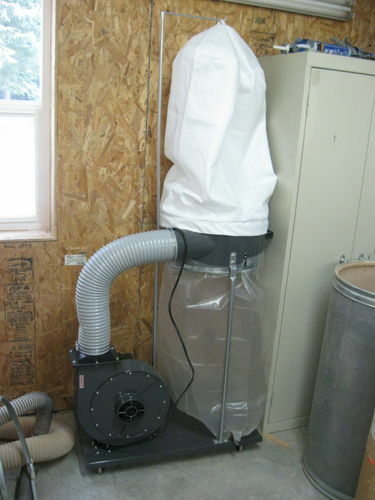 eliminating the bags and venting to the outside should increase air flow. 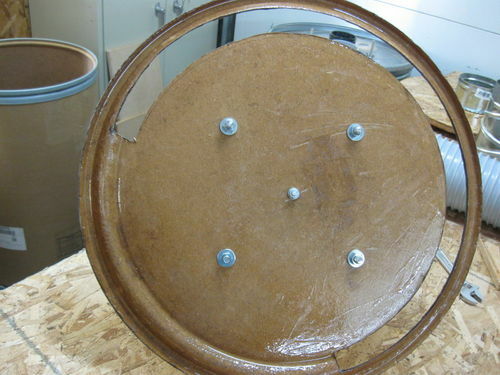 I would suggest a barrel with wheels and a flexible attatchment? On the other hand I made mine with a fifty gallon drum LOL! Tom, great minds…. I do plan to make the barrel mobile. The sheet metal fitting at the intake of the collector body slips out when I need to remove the barrel.